206 grams and 37 cm long, this Belgian soup ladle is decorated on the back of the wide handle with a pair of sprays of leaves. Hallmarked for Belgium, 800 silver, made between 1831 and 1868. Makers' mark CD surmounted by a Hammer. 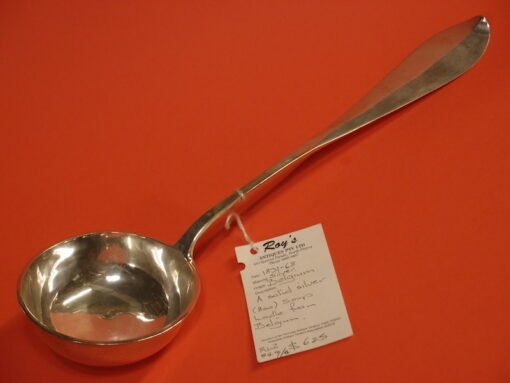 206 grams and 37 cm long, this Belgian soup ladle is decorated on the back of the wide handle with a pair of sprays of leaves. Hallmarked for Belgium, 800 silver, made between 1831 and 1868. Makers’ mark CD surmounted by a Hammer.